In the first half of the XVth century the popes gained direct authority over the government of Rome and they assumed the dual role of spiritual and civil leaders. This dual role was later on formalized in the sentence In Nome del Papa Re (in the name of the Pope King). In his role as a king, the pope was exposed to criticism and this was soon voiced by the Romans through very short compositions in verse ridiculing or otherwise blaming the behaviour of the popes. Nicholas V (1447-55) was one of the first popes whose action, the bloody repression of a conspiracy, was sharply criticized in a short poem. blood is abundant in Rome while there is lack of wine. The anonymous authors of the poems were often very close to the pope and had direct knowledge of confidential information. A little poem suggested the title of Padre della Patria (Father of the Nation) to be given to Pope Innocent VIII (1484-92) because of his sixteen natural children. 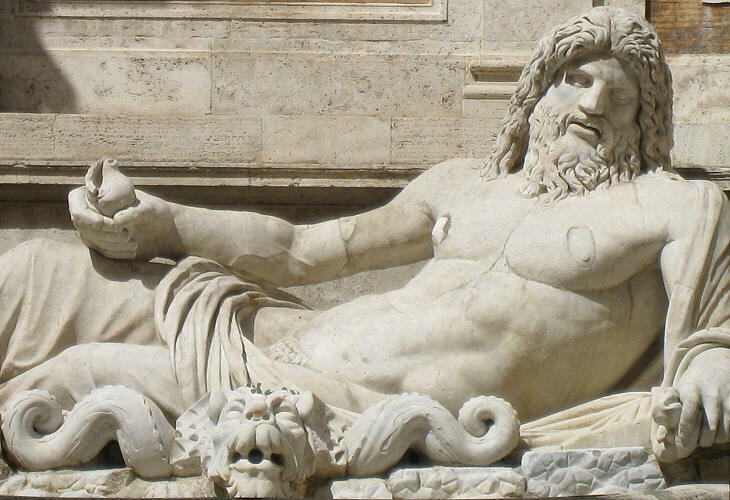 In 1501 Cardinal Oliviero Carafa put in a small square near Piazza Navona the torso of a statue representing Menelaus with the body of Patroclus. Each year on April 25 the Cardinal chaired a sort of Latin literary competition and poems were posted on the statue and occasionally this happened outside the competition period. In this way Pasquino (the name given to the statue) became the first talking statue of Rome and it is still used from time to time for posting messages and claims. 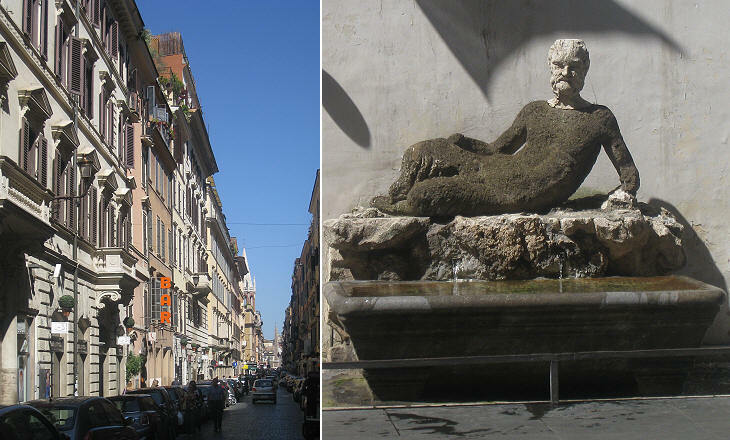 The little square is named after him Piazza di Pasquino and pasquinata (pasquinade) is the word used for a short satire exhibited in a public place. Pasquino soon became very popular and especially during the conclaves every night new gossips were posted to influence the election of the new pope. 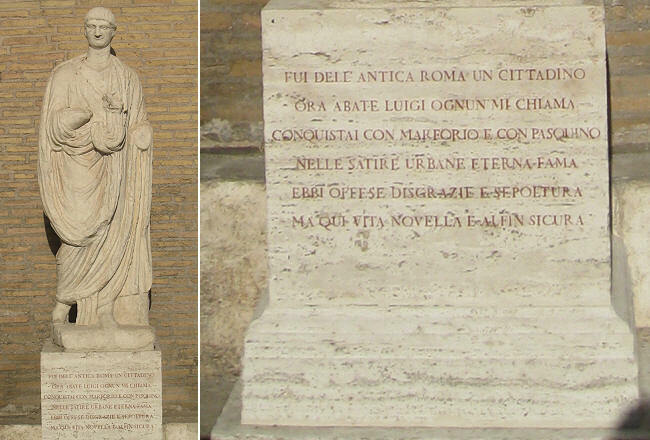 Pope Adrian VI (1522-23) considered throwing Pasquino into the Tiber and other popes had similar thoughts, but they feared to fall into ridicule by punishing a statue. Severe laws however were issued to stop the practice and Pasquino was put under surveillance. This led to the undesired result of multiplying the talking statues of Rome. The colossal statue of a river-god at the foot of the Capitol Hill became soon a second Pasquino. It was named Marforio and it added zest to the lampooning of the popes as Pasquino and Marforio started talking to each other. In 1679, with the excuse of preserving a fine antique statue, Marforio was incarcerated inside Palazzo Nuovo di Campidoglio. 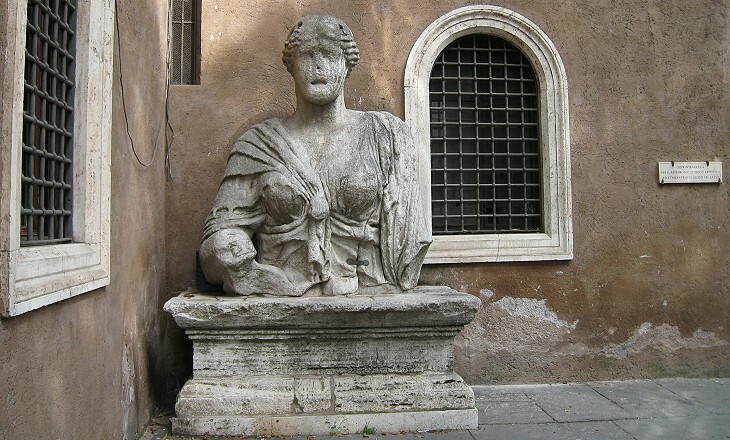 The mutilated marble bust of a colossal statue of a priestess of Isis near Chiesa di S. Marco became known as Madama Lucrezia and it provided a female character to the little choir of the talking statues, which was called il Congresso degli Arguti (the Shrewd Congress). The target of the pasquinade was Pope Urban VIII Barberini (1623-44) who had used the bronze tiles of the Pantheon for the Canopy of St Peter's. 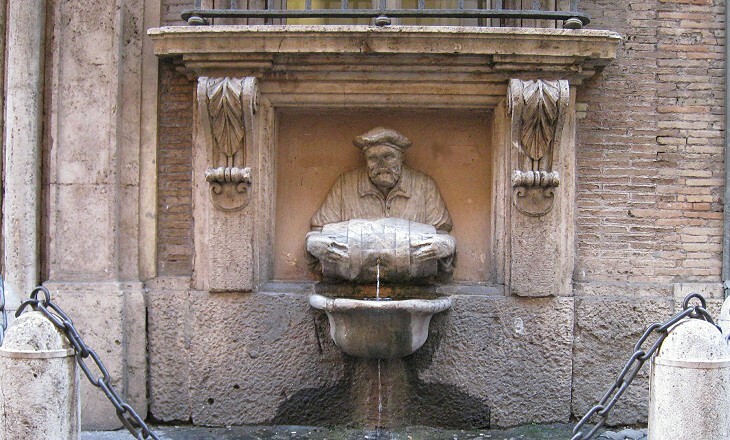 The only talking statue which is not an ancient Roman statue is Il Facchino (The Porter) which ought to be called L'Acquaiolo (The Seller of Water) which portrays a Renaissance seller of water with his little cask. This trade declined at the end of the XVIth century when Pope Sixtus V started reactivating the ancient Roman aqueducts. The statue is located in Via del Corso near Palazzo Decarolis. Close to Pasquino, it is located near S. Andrea della Valle, the Roman statue of an unidentified emperor (the head belongs to another statue) was allowed to talk to Pasquino and Marforio. The statue is commonly known as l'Abate Luigi. Via del Babuino (Baboon) is named after an old statue of Silenus, the drunken companion of Dionysus, which was referred to in derogatory terms as il Babuino. Its location in the Strangers' Quarter of Rome made it an alternative site for posting pasquinades without a high risk of being caught. Il Babuino was also used by the large community of foreigners living in the area for lampooning members of the community.